Kirklees in West Yorkshire sustains an enviable Music Education Hub. The strength of the funded set-up showed in the quantity and quality of bands making the trip to Chester le Street. The Youth Section of this year's GNBBJF began with Kirklees' Musica Youth Jazz (MD Adam Kingham). tenor saxophonist Isobel Kerr featured on In a Sentimental Mood with the award-winning vocalist Daisy Cameron impressing once more on Cheek to Cheek and Mr Zoot Suit. Tyne Valley Youth Big Band (MD Dave Hignett) presented a street brass band-infused set. A Dave Hignett arrangement of the Hypnotic Brass Ensemble and a Youngblood Brass Band arrangement of Human Nature were just the tunes to engage the young musicians from Northumberland. Similarly, Van Morrison's Moondance and Jim Peterik's Vehicle succeeded in producing an entertaining set performed with enthusiasm and no little talent. The renowned Wigan Youth Jazz Orchestra (MD David Little) would take some stopping. The boys and girls of the orchestra assembled on stage looking the business. David Little counted them in, then, for the most part, stood to one side content to let the orchestra do its thing. From Gordon Goodwin's Fool Me Once to You Can't Take That Away from Me to Manteca this was tremendous stuff. Soloists out front, on mic, this was the way to present a programme! 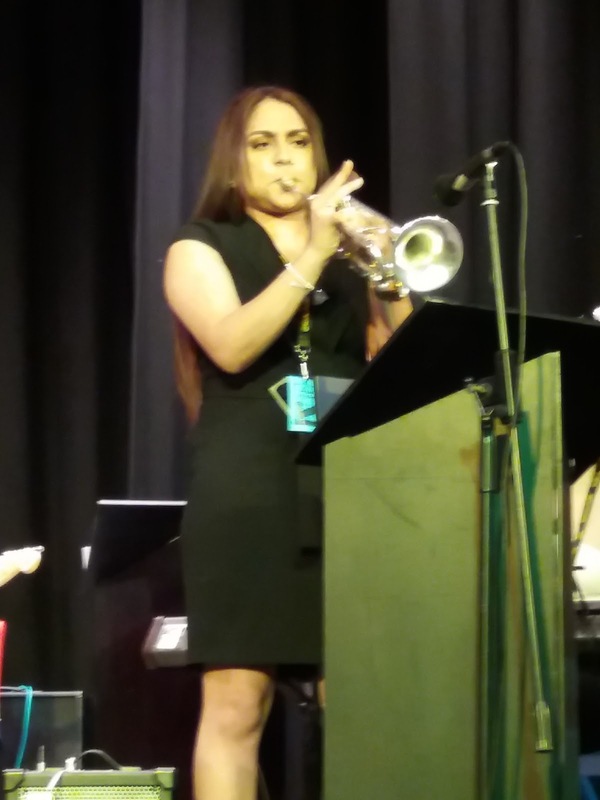 Simran Prakash, trumpet (see photo), made her presence felt with a fearless display. Could anyone derail Wigan? Scissett Youth Band (MD Johnny Beevers) adopted a radical approach - a mix of horns in two lines facing one another with percussionists at the back of the stage and, no obvious musical director. A street funk attitude, would the adjudicators be impressed with the West Yorkshire outfit? Another White Rose raider - Musica Shelley Big Band (MD Adam Kingham) - began wih a distinct advantage in having award-winning vocalist Daisy Cameron to sing a couple of numbers. The Look of Love and Cry Me a River confirmed Cameron's newly acquired status. Durham County Youth Big Band (MD Shaune Eland) rattled through five peices concluding with Matt Robert's commissioned work Steam Funk. For the record, MD Eland blew the whistle! It had been a long day, indeed a long weekend with the potential for reporting errors. The Musica collective entered two bands with near identical names. The printed programme confused matters. Your correspondent stands to be corrected but it appeared that Musica Holme Valley Big Band (MD ? ), scheduled to be the last band to perform, actually got in there ahead of Musica Colne Valley Big Band - spot the difference...Holme, Colne. Musica Holme offered four tunes, one of them being Crazy Little Thing Called Love. The recently formed Tees Valley Youth Jazz Collective (MD Jud Downs) is a work in progress and Jud Downs has the makings of a band on his hands. Sage Gateshead's Jambone (MD Paul Edis) gave the penultimate performance at this year's GNBBJF. Two numbers - Lullaby of Birdland and Edis' Embrace the Silence - presented a considerable challenge for the young musicians and to their credit produced a fine set. Emily McDermott sang with confidence and a new found expressiveness into the bargain. Diminutive trumpeter Ferg Kilsby (pictured) impressed as did saxophonist Jack Pearce and guitarist Tom Henery, particularly on Edis' composition. The rhythm section - bassist Alex Shipsey and drummers/percussionists Maeve Thorpe and Dylan Thompson - made a considerable and mature contribution. Closing this year's festival was another Yorkshire orchestra - Musica Colne Valley Big Band (MD ?). It was somehow fitting that the final number of the weekend was from the pen of festival favourite Gordon Goodwin. Yes, Jazz Police broke up the party for another year. The adjudicators deliberated one last time. Drummer Mark Jon Bolderson died in August 2017. A mainstay of the Tyne Valley Big Band, a foundation - the Mark Jon Bolderson Percussion Foundation - was established to help promising young percussionists. 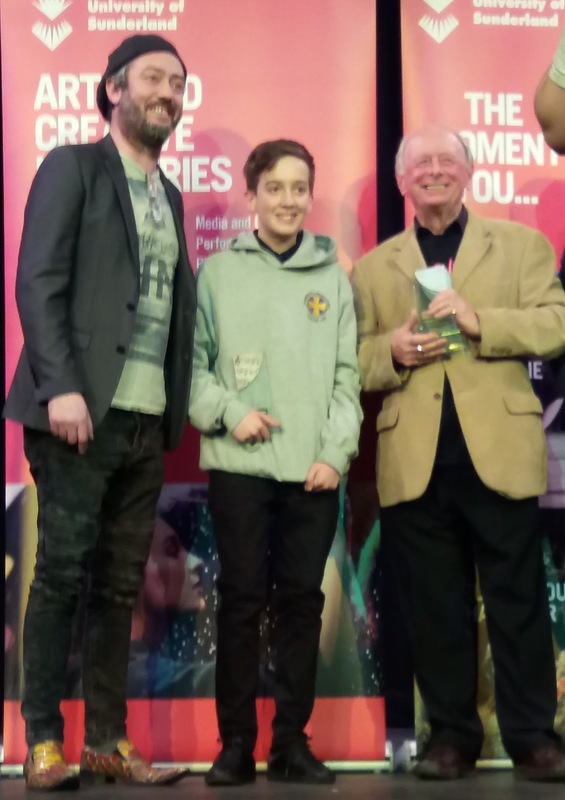 At this year's Great North Big Band Jazz Festival the first annual award was made to the drummer of the Wigan Youth Jazz Orchestra - Katie Proctor.